X-Ways Forensics is an advanced work environment for computer forensic examiners and our flagship product. Runs under Windows XP/2003/Vista/2008/7/8/8.1/2012/10*, 32 Bit/64 Bit, standard/PE/FE. (Windows FE is described here, here and here.) Compared to its competitors, X-Ways Forensics is more efficient to use after a while, by far not as resource-hungry, often runs much faster, finds deleted files and search hits that the competitors will miss, offers many features that the others lack, as a German product is potentially more trustworthy, comes at a fraction of the cost, does not have any ridiculous hardware requirements, does not depend on setting up a complex database, etc.! X-Ways Forensics is fully portable and runs off a USB stick on any given Windows system without installation if you want. Downloads and installs within seconds (just a few MB in size, not GB). 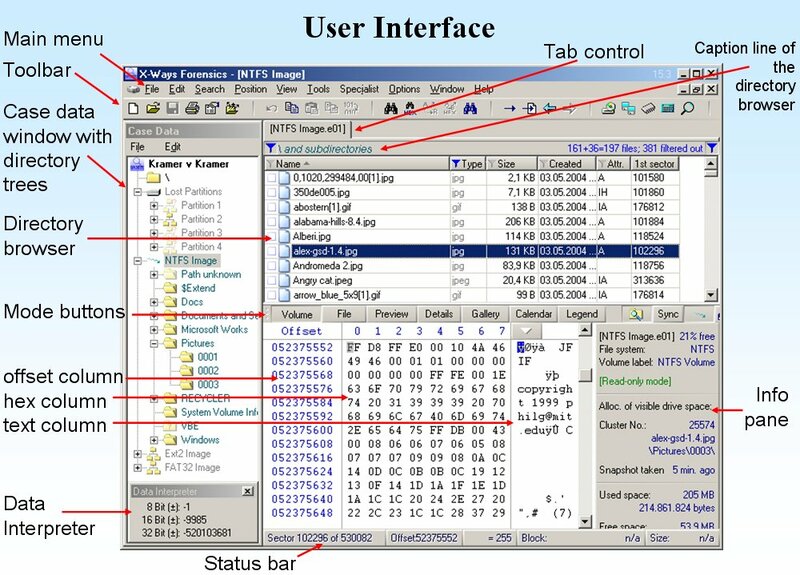 X-Ways Forensics is based on the WinHex hex and disk editor and part of an efficient workflow model where computer forensic examiners share data and collaborate with investigators that use X-Ways Investigator. Previous mailings can be found in the newsletter archive. Evaluation version not publicly available, only on request to law enforcement, government agencies and certain corporations. Please provide us with your full official address and contact details. Eval. version of WinHex. Ability to tag files and add notable files to the case report. Ability to enter comments about files for inclusion in the report or for filtering. Support for multiple examiners in cases, where X-Ways Forensics distinguishes between different users based on their Windows accounts. Users may work with the same case at different times or at the same time and keep their results (search hits, comments, report table associations, tagmarks, viewed files, excluded files, attached files) separate, or shares them if desired. 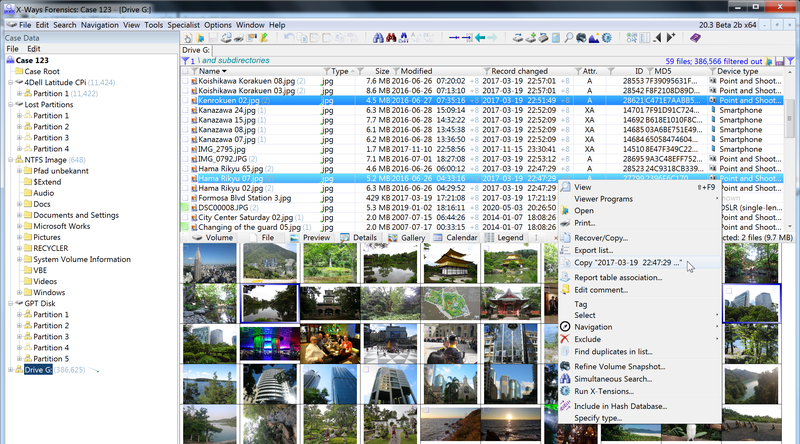 Ability to include files from all volume shadow copies in the analysis (but exclude duplicates), filter for such files, find the snapshot properties, etc. The basis for a listed file is practically just a mouse click away. Easily navigate to the file system data structure where it is defined, e.g. FILE record, index record, $LogFile, volume shadow copy, FAT directory entry, Ext* inode, containing file if embedded etc. Automatic cell background coloring based on user-defined conditions helps to draw your attention to items of interest without having to filter out all non-matching items. Can produce a powerful event list based on timestamps found in all supported file systems, in operating systems (including event logs, registry, recycle bin, ...), and file contents (e.g. e-mail headers, Exif timestamps, GPS timestamps, last printed timestamps; browser databases, Skype chats, calls, file transfers, account creation...). Event timestamps can be sorted chronologically to get a timeline of events. They are represented graphically in a calendar to easily see hotspots of activity or periods of inactivity or to quickly filter for certain time periods with 2 mouse clicks. Option to sort search hits by their data and context instead of just by the search terms to which they belong. Ability to filter search hits by the textual context around them using an additional keyword. Owners of licenses for X-Ways Forensics can achieve Gold status. *Limitations under Windows Vista and later: Physical RAM cannot be opened. Unable to write sectors on the partitions that contain Windows and WinHex.